This 61-year old male master mechanic from Hixson Tennessee was referred to Dr. Gardner with itching and pigment skin changes on his legs, which was worse on the right leg. 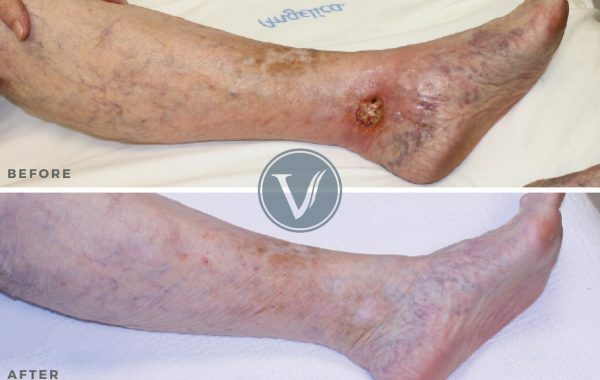 He reported a history of venous ulcers and that his symptoms have been progressing for many years. His job requires him to sit and stand for long hours while working on vintage cars. He became concerned when he began experiencing periodic drainage from the right ankle. His ultrasound revealed superficial venous disease in both legs, which was worse on the right leg. Dr. Gardner treated both of his legs using modern endovenous laser ablation procedures to eliminate his incompetent superficial veins. Photos were taken at 10 months. The patient notes his skin changes have dramatically improved and his leg pain and swelling are greatly reduced. He is now able to work without having to stop and take breaks.